This Ukrainian man had political discontents about his own country of Ukraine, which appears to be one of his motivations in trying to grab the limelight in Sochi. He told the crew that he had placed a bomb on the plane. 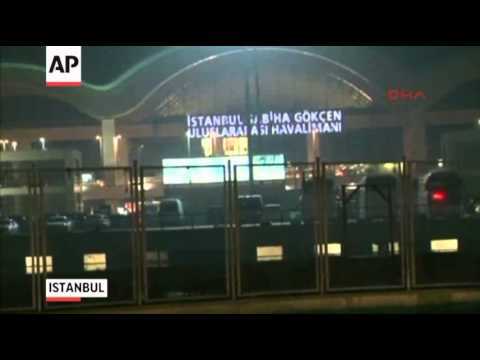 The crew of the airplane cleverly diverted to Istanbul and told the hijacker it was Sochi. Negotiators then got him to let the passengers go. Security men mingled among the departing passengers and then grabbed the hijacker. They found no sign of a bomb on the plane. Note that this Ukrainian, presumably an Eastern Orthodox Christian, threatened to blow up an airplane full of innocents. He was foiled by Turkish Muslims. The articles on the Ukrainian hijacker do not refer to him as a “terrorist,” even though threatening to blow up a plane in order to make a political point is clearly terrorism by most definitions of the word. If the hijacker had been a Muslim, the press would certainly have declared him a terrorist and the fact that he threatened to bomb the plane would not have been taken lightly. Now it is being said that he was very drunk. Next we will begin hearing that the Ukrainian hijacker is mentally unbalanced. But Muslims who act in this crazy way are never viewed as troubled loners even when it seems pretty obvious that that is what they are. That Muslim Turks are among the heroes of this story won’t be mentioned explicitly by any of the Islamophobic web sites who constantly stalk innocent Muslims.